In the last few months, as the popularity of Fidesz has been steadily declining, signs of serious internal divisions within the party have been proliferating. Ever since November one opinion poll after the other has reported serious losses in popularity for both Viktor Orbán and his party. Fidesz still leads, but the parties on the left are gaining ground. In fact, for the first time, the number of voters favoring all the democratic opposition parties combined is slightly higher than that favoring Fidesz. It was almost inevitable that Fidesz’s political leadership would start looking for explanations for the waning popularity. 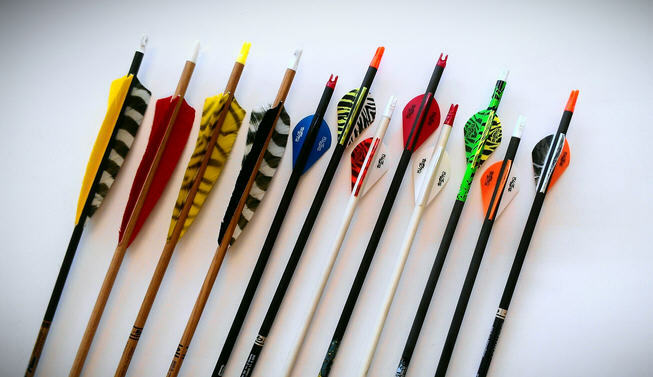 Of course, the most obvious target should be Viktor Orbán himself. After all, Fidesz is a monolithic party where, according to grumbling party leaders, all decisions are made by the prime minister, who is also the head of the party. His confidants nowadays are not the grand old men of Fidesz but upstarts like Antal Rogán, János Lázár, or the mysterious Árpád Habony who allegedly has no position either in the party or in the government yet is privy to the most confidential information if not state secrets. The old Fidesz leaders who joined the party twenty-five years ago either left a long time ago or Viktor Orbán set them aside. The less important characters had to be satisfied with positions inside state companies or insignificant administrative offices; the more important ones were either given positions that have clout on paper only, for example János Áder and László Kövér, or were shipped off to Brussels. Zoltán Pokorni, who at one point was chairman of Fidesz, had to be satisfied with a humble district mayoralty. Until last November Fidesz spoke more or less with one voice, the voice of Viktor Orbán. If there were doubting Thomases, they became convinced by the cleverly orchestrated elections that, after all, “Viktor was right.” In fact, he is a political genius who can overcome all obstacles and lead the party to victory not just for the next four or eight years but for a very long time. Now, however, it looks as if Orbán has lost his touch. Instead of being able to correct his mistakes, he piles new ones on top of earlier ones. Moreover, several times in the last few months he had to retreat, which must have shaken the confidence of his closest associates. I suspect that we are still not at a point that we will hear open criticism of Viktor Orbán himself. Instead, the criticism is directed against the men around him. The first public quarrel occurred in December when Zoltán Pokorni said a few disapproving words about the extravagant lifestyle of János Lázár. Kövér chimed in, taking Pokorni’s side. It is a well known fact that Kövér is no friend of Lázár, who runs the government’s daily business, serving as de facto prime minister, while Orbán himself acts like its all-mighty president, moving effortlessly on the stage of world politics. The quarrel didn’t end there. Lázár shot back and told Kövér that “a political veteran should think twice before he attacks us out of personal resentment or for political gain because he not only weakens us but also weakens or even executes himself.” I guess in this instance “execution” means the end of this veteran’s political career. This is not an idle threat. When after the lost 2006 election Orbán found out that some of his political friends at a party had discussed the desirability of replacing him because of his mistaken election strategy, they were promptly sent into political exile. The most prominent victim was János Áder. More recently, Tibor Navracsics, who as minister of justice criticized the legislative practices introduced by the prime minister’s office, soon enough found himself in Brussels. In January we learned that József Szájer and János Kövér also have their disagreements, primarily over Hungary’s relations with the European Union. Szájer is an old timer all right. He was one of the founders of Fidesz but, as opposed to the provincial Kövér, is now serving his third five-year term as MEP in Brussels. In his case, Brussels is not a political exile. He is still a very close associate of Orbán. In fact, Szájer’s wife is perhaps the most important person in the Hungarian judicial system today. In any case, the two old friends from college don’t see eye to eye on the European Union. Kövér belongs to the right wing of Fidesz, a Euro-skeptic who ordered the removal of the EU flag from the parliament building and instead put up a newly-designed flag of the Szeklers living in Romania. About three weeks ago Kövér in an interview expressed his dislike of the European Union and said that it might not be a bad idea to think about leaving. Szájer openly expressed his dissatisfaction with Kövér’s ill-considered statement in an interview on ATV. Then came another open disagreement, this time between László L. Simon, undersecretary of János Lázár in the prime minister’s office, and Gergely Gulyás, the right-hand of László Kövér and head of a parliament commission dealing with legislative matters, who talked about the likelihood of modifying the law on freedom of assembly. This announcement was unfortunate. It looked as if the Orbán government was planning to restrict the current law and was thereby intending to limit the kinds of demonstrations that took place recently on the streets of Budapest. L. Simon immediately announced that the idea was Gulyás’s private opinion. The government has no intention of revisiting the law on assembly. A very wise move on the part of the government. Then about ten days ago Zoltán Illés, earlier undersecretary in the ministry of agriculture in charge of the environment, decided to go public with his criticism of the Orbán government’s nonexistent environmental policies. Illés is a committed environmentalist and was useful to Viktor Orbán when Fidesz was in opposition as he attacked the socialist-liberal governments for their neglect of environmental issues. Illés was everywhere a tree was cut down. He organized demonstrations and blocked several projects because of environmental considerations. In 2010 he most likely saw himself as the next minister of the environment and must have been taken back when the ministry was abolished and he became only an undersecretary in the ministry of agriculture. But, as he explained recently, he still hoped that even in this position he could be effective. That turned out not to be the case. His position was stripped of practically everything that used to belong to the minister of the environment. Between 2010 and 2014, while in office, the formerly vocal Illés was quiet as a mouse for example when hundreds of trees were cut out overnight around the parliament building. Eventually he no longer could stand it. He was the only Fidesz member of parliament to vote against building a new reactor at the Paks nuclear power plant. That sealed his fate. Not only is he no longer an undersecretary, he didn’t even receive a cushy job. Now he “tells all” everywhere he has the opportunity. In the last few days there have apparently been open disagreements between Lajos Kósa and Antal Rogán on immigration; between Zoltán Balog and Károly Czibere, his undersecretary, on the segregation of Roma children; between Antal Rogán and László Trócsányi, minister of justice, on the necessity of new legislation in defense of religions. Finally, newspapers reported yesterday that János Bencsik, a Fidesz member of parliament, published a long critique of his party and the government on his own website. The parrots are starting to learn words of their own. What evil forces lurk behind the Hungarian demonstrations? On December 29, 2014 Antal Rogán, whip of the Fidesz caucus, announced a new program called the “National Defense Action Plan” which, he claimed, was needed because the country is under siege. Details were not revealed at the time, but I suspected that it was intended to take the wind out of anti-government sails. “Action plan”–it sounds so manly, Ildikó Lendvai sarcastically remarked in an opinion piece that appeared in Népszava on January 3. She found the whole thing ridiculous until she read an interview with Gergely Gulyás, chairman of a newly created parliamentary committee on legislative activities. In this interview Gulyás said that it was time to make the law on free assembly more restrictive. “I immediately stopped laughing,” Lendvai wrote. This new action plan–because this is not the first in the history of the Orbán regime–should really be called the “Government Defense Action Plan.” The goal is to put an end to anti-government demonstrations. Within a week after the Gulyás interview, Viktor Orbán must have realized that he went too far. With all the international attention on the demonstrations and anti-government sentiment, tightening the law on free assembly might be seen as overreach. László L. Simon, undersecretary in the prime minister’s office who lately has been close to Orbán, was given the task of discrediting Gulyás. On January 7 he announced that “the government is not contemplating any changes in the law on assembly.” Gulyás simply expressed his own private opinion. Oh, sure! Since the Orbán government and its supporting media equate the government with the nation and the country, Magyar Nemzet argued that any support of the demonstrations by the democratic opposition parties is more than suspect. If opposition parties stand behind the demonstrations–as they don’t at the moment–it is a mortal sin, bordering on treason, from their point of view. The truth is that the organizers ask for donations from the participants on the spot, and each time they manage to collect a few million forints. They have also made their financial records public on Facebook. Antal Rogán made only veiled references to taking the case of financing the demonstrations to court if necessary, but a young teacher of Hungarian literature, István Tényi, decided to act. He filed a complaint against the organizers of the recent mass demonstrations on suspicion of fraud. Tényi has a lot of experience in filing charges. He was the one who filed a complaint against Ökotárs, also for fraud, in connection with the group’s handling of the Norwegian Civic Funds. While he was at it, he filed a complaint against HVG because of its cover story showing Fidesz politicians gathering around the NAV chairwoman, Ildikó Vida, as if around Joseph and Mary with the baby Jesus. What I found out about Tényi isn’t pretty. He was fired from his first job because he sent threatening e-mails to his students indicating that the school will meet the same fate as Baghdad under the massive American bombing. Currently he teaches at the Károly Than Ökoiskola. A writer of a micro-blog found a “disgusting” item–his adjective–on Tényi’s Facebook page. 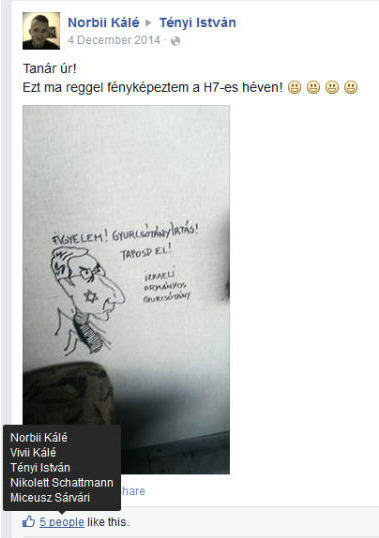 One of his students sent him an anti-Semitic caricature of Gyurcsány. The former prime minister was depicted with the body of a cockroach and a Star of David on his face. The message was “the Israeli Gyurcsány should be crushed” just like a cockroach. Tényi must have enjoyed the caricature because he was one of the five who “liked” it. The other four, I suspect, are his students. Otherwise, Tényi is 32 years old and graduated from ELTE’s Faculty of Arts in 2006. He is a member of the presidium of Fidelitas in Terézváros (District VI) where he functions as a coordinator. His favorite film is Star Wars IV-VI and his “ideal” is Sándor Petőfi. His favorite drink is mineral water. Most important, he enjoys filing charges against people who don’t agree with his party and the Orbán government. This man, if one can believe the messages on his Facebook page, is quite popular among his students. Imagine the education they are getting from this man. And unfortunately, there are far too many István Tényis among the followers of Viktor Orbán. 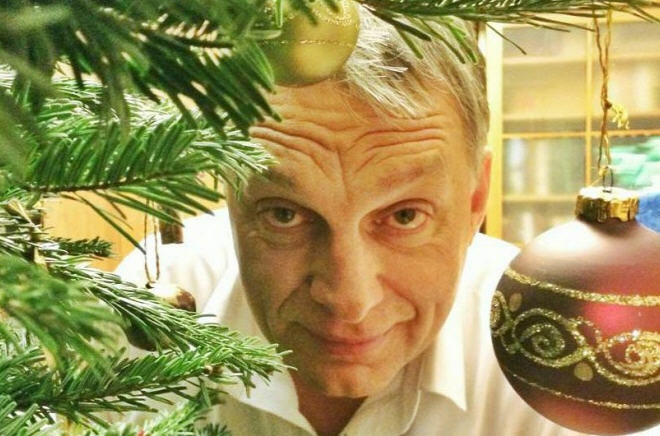 The Hungarian media is full of articles and opinion pieces about Viktor Orbán’s disappearance since Christmas Eve, when he posted a silly selfie peering from behind a Christmas tree. He missed his customary New Year greetings and was not spotted anywhere getting in or out of his Volkswagen minibus. Given the less than friendly domestic atmosphere, the media and the public suspect that he’s in one of his alleged depression cycles that usually happen when things aren’t going well for him. When asked, the chief of the prime minister’s press department claimed that he is not on vacation. He is working as usual, but from home. And those Hungarians who can scarcely wait for one of his Friday morning monologues will be happy to know that the prime minister will deliver his pearls of wisdom tomorrow. In Hungary everything revolves around Viktor Orbán. If he disappears for over two weeks, the domestic news flow shrinks to practically nothing. Issues that are currently making waves are the results of earlier bad decisions, like the law on Sunday closings and the introduction of tolls on roads that were until now free. Since nothing is happening on the government front, I’ll turn to a recent article by András Bruck, one of my favorite political commentators. About this time of the year, a day after Christmas in 2013, I wrote a fairly lengthy summary of one of his essays entitled “The Sign” that appeared in Élet és Irodalom. Unfortunately, the essay is not available for non-subscribers to ÉS, and therefore I suggest that you read my post, “András Bruck’s new encounter with George Orwell’s 1984.” In brief, Bruck recalls that in the early 1980s, when he was first able to read 1984, he was disappointed. The book was about “a different bad world” from the one in which he lived. While making love he felt neither fear nor hatred. He didn’t consider the three famous slogans of Ingsoc, WAR IS PEACE, FREEDOM IS SLAVERY, IGNORANCE IS STRENGTH appropriate for Kádár’s Hungary. However, re-reading the book, he came to the conclusion that “every word of that book from the first to the last is about this sick, deformed regime in which, just like in the novel, the binding agent of power is lying.” His conclusion is that Hungary is a dictatorship pure and simple and that those who claim that Hungary is still a kind of democracy are kidding themselves. Lately, András Bruck’s essays no longer appear in ÉS but in HVG, perhaps because he would like to reach a wider audience. Earlier he wrote infrequently, but since early November he has published two articles and gave an interview to Sándor Friderikusz on ATV. This radical critic of the Orbán regime seems to be optimistic for the first time in the past five years. The title of his November 7 article is “Before newer demonstrations.” He correctly anticipated that the first large demonstration would be only the first of many. As he said in the interview, he had enough of “a regime in which a well-developed socialism came into being for the rich minority and an underdeveloped capitalism for the majority.” This rich minority receives undeserved benefits without competition while the majority gets only the burdens of a poorly developed capitalism. It is this deformed political system which at last is meeting resistance, not only by those who went out to demonstrate but also by those hundreds of thousands who are by now openly critical of the regime and want to put an end to it. Bruck maintains that although a lot of people charge that Orbán’s political decisions are ad hoc, the truth is different: “Here everything happens according to a master plan.” It all started with two concepts cunningly devised: (1) a centralized political field of power that ensures permanent governing with a weak opposition and (2) the introduction of unorthodox economic planning. These two concepts, once put into reality, “enabled Viktor Orbán to establish a one-party system and his own personal rule.” His “illiberal confession” last summer merely marked the finished job. Just as the socialist one-party system was impossible to reform, the Orbán regime cannot be “corrected” either. But the good news is that “this sick, deformed regime … has as much chance of survival as all its similar predecessors.” And “this new mass on the streets last week sent a clear and understandable message and for a moment the government took notice.” But only for a moment because they are convinced that they will be lucky and “there will never be a last straw.” In dictatorships it is quite often the case that there is a “total lack of any sense of danger” among the perpetrators. The people who have been serving this regime believe that they have nothing to worry about. It doesn’t occur to them that one day a new parliament may declare the present system a dictatorship and hence illegitimate. They think that their clever lawyers will save them and that their wealth will be safe stashed away somewhere outside of the country. But this time these sins shouldn’t go unpunished. Only unblemished individuals should sit in judgment. Some opposition politicians are not worthy of the task. The Hungarian public is fixated on everything related to cars and driving, especially when it’s a question of money. Announcements about gasoline prices are daily fare in Hungary. If the price of gasoline goes up or down a couple of forints, it’s big news. Hungary is a poor country, we must not forget. Perhaps the most serious crisis since the change of regime occurred when it was announced that gasoline prices would have to be raised substantially. A blockade of all roads nationwide by taxi drivers paralyzed the country for three days and forced a government retreat. Therefore it’s mighty strange that the Orbán government, already under considerable domestic and foreign pressure, decided to introduce a new toll system–and a badly designed one at that, which is bound to encounter serious opposition. The system is geographically based. Each county, and there are nineteen of them in Hungary, is a separate toll unit. A driver who plans to drive on a toll road but strictly within the confines of his county need purchase only a single “matrica/vignette.” A few decades ago that might have been reasonable. A trip from Pécs to Harkány was considered to be quite a journey, and going to Hosszúhetény was an outright adventure. But these days, even with lower gasoline prices, people with cars are a lot more mobile. The maps the government provided to make car owners’ lives easier are confusing. Some of them even had mistakes. If I figure it right, a person driving from Budapest to Pécs on the relatively new superhighway will need four matricas. Admittedly, the new county matricas are a great deal cheaper (5,000 Ft. each) than the former pass that was good for the whole country at 42,980 Ft/year. But what a hassle to figure out what counties you’re going through each time you plan a trip and which passes you’ll have to buy before you venture outside your own county. Even worse, think about those occasions when you have to get somewhere quickly–a family illness, a business emergency, the funeral of a colleague. You don’t just gas up the car and go. You also have to make sure you have the appropriate passes. Let’s take a not too far-fetched example. A businessman who travels frequently from Pécs to Budapest will have to buy three or four matricas. And let’s say his family also wants to visit an aunt in Somogy or in Zala. The expenses start adding up. The suspicion is that the government eventually wants to stop issuing those matricas that are good for a limited period of time. They are handy when the family goes on holiday to Lake Balaton or the Mátra Mountains. For ten days they pay only 2,975 Ft.; for a month, 4,789 Ft. Drivers had to purchase their matricas by January 1, but as of December 29 no matricas were yet available. The new system was introduced in a great hurry without adequate preparation, as even Gergely Gulyás, the honey-tongued Fidesz politician, had to admit. By Friday (January 2) the computer system handling the issuance of matricas at gas stations crashed. There were long lines of people standing in the cold and rain in front of the headquarters of the office that takes care of the country’s roads. Purchasing passes online was not any easier because the site couldn’t handle the traffic. And confusion reigns. Csaba Hende, the minister of defense and a member of parliament for Vas County, is furious. Based on the information he received, he promised his constituents that M86, a road between Szombathely and Vát, was going to be toll free. Came the surprise the following day: anyone using this new road will have to get a county matrica. There are bits and pieces of roads–because this is what we are talking about–where the introduction of tolls makes no sense. Perhaps the most egregious example is the road to the Budapest Airport. A single trip a year to and from the airport would require a Budapester to buy a county matrica. The attached map gives some idea of what I’m talking about. 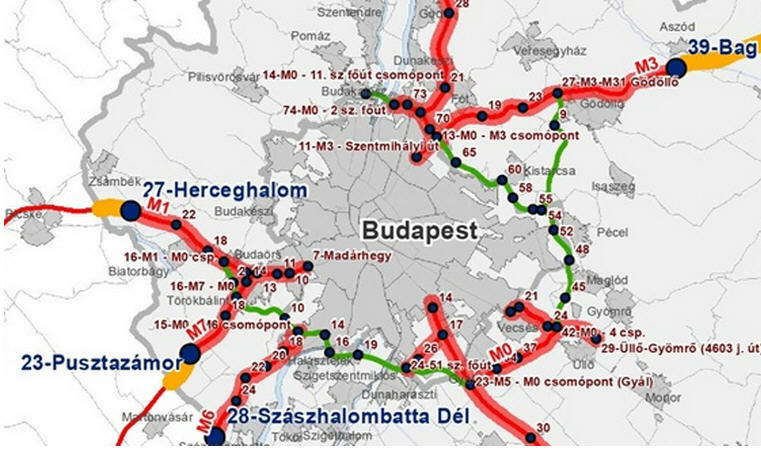 As you can see, M1 and M0 serve a very important function: to save Budapest from heavy thru traffic, mainly the thousands and thousands of trucks that cross the country toward the north, the east, and the south. It is hard not to notice that certain parts of a single highway are free while other parts are toll roads. The reason is that those sections marked in green were built with EU support, for the specific purpose of ridding Budapest of the heavy truck traffic that is environmentally harmful. The European Union demanded that these roads remain toll free. Well, on the map they are marked free, but the roads leading to these free sections are toll roads, so, contrary to EU intentions, truckers don’t get a free ride around Budapest. You may ask what the orange-colored sections signify. These three short sections are still within the limits of Pest County, but if you drive onto them, you must have a county matrica for Fejér County in the case of M1 and M7 or Nógrád County in the case of M3. The distances are small. The trip from Törökbálint to Pusztazámor, for instance, is only 17.3 km or 10.7 miles. A civic group that already blocked the M1 and M7 superhighways for a minute in December is threatening the government with an ultimatum. They now promise a total blockade of all roads if the government does not withdraw the new county toll system by the end of February. They will also demand the resignation of the Orbán government. The organizer is Zoltán Büki, a businessman and Együtt-PM activist in the county of Nógrád. Viktor Orbán must have had a rough couple of days. First came the bad news that Vladimir Putin had cancelled the Southern Stream project, and then yesterday John McCain, the Republican nominee for president in 2008 and chairman of the Senate Foreign Relations Committee, lashed out at him. In a speech delivered prior to the vote on Colleen Bell’s appointment to be the next U.S. ambassador to Hungary he gave a long list of objections to her appointment. The upshot was that McCain considers Hungary to be a strategically important country where a seasoned diplomat should head the mission instead of a political appointee. Zoltán Kovács, undersecretary in charge of foreign communication, is usually the first to raise his voice. He announced that “Hungarian diplomacy will immediately get in touch with American senator John McCain,” but he added that from the text it is clear that McCain was not talking about the Hungarian prime minister but about Vladimir Putin. Kovács’s most likely intentional misreading of the text could not be maintained for long because several Hungarian newspapers and television stations got in touch with the communication director of Senator McCain, who affirmed that there was no mistake. The senator was indeed talking about Viktor Orbán. The Ministry of Foreign Affairs and Trade moved into action and called in M. André Goodfriend, the U.S. chargé d’affaires, to tell him, I assume, how wrong McCain was about Viktor Orbán. Considering that McCain is a Republican, I can’t quite see what Goodfriend as a representative of the Democratic Obama administration is supposed to do about McCain’s assessment of the Hungarian political situation. 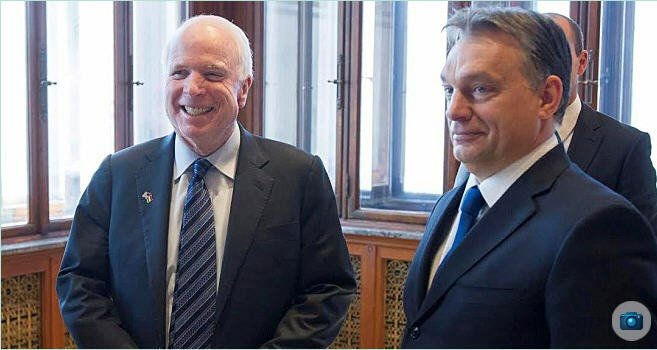 And yesterday Péter Szijjártó announced that McCain must have based his opinion about the Hungarian prime minister on the antagonistic media because if he knew the real situation he would never call Orbán a neo-fascist dictator. The Hungarian response to any negative reaction to the Orbán government is always the same: The Hungarian citizens voted for this government three times this year and everybody should respect their decisions. Szijjártó also indicated that the Hungarian Embassy in Washington will get in touch with the staff of Senator McCain and will inquire about “the background of his statements” concerning the Hungarian prime minister. Gergely Gulyás, a member of parliament and one of the deputy presidents of the assembly, was blunt. According to him, the “veteran senator for a short period of time lost his critical faculties.” Some pro-government journalists also used strong words. András Stump of Válasz called the 78-year-old senator “senile, ancient” (agg, vén) and not to be taken seriously. András Bencsik, editor-in-chief of the far-right Demokrata, called him an idiot. Another right-wing commentator again alluded to McCain as being incoherent during the session. But he did not stop there. He accused McCain of being far too friendly with Ukrainian Nazi politicians. And then he came to the crux of the matter: why is Hungary suddenly so important to the United States? Because of the United States’ interest in selling American shale gas to Europe. The Americans have become worried about Hungary being a middleman between Russia and Europe, which may result in their supplying all of Europe with Russian gas instead of their own. Otherwise, all the rest about democracy, about the illiberal state, about NGOs is of no interest to the United States. They are only excuses that mask the real intent. Of course, this story our man concocted is total nonsense, but what is really worrisome is that the official advisers to the Hungarian government, the great “political scientists” of Századvég, also seem to think along the same lines. Yesterday I cited some foreign policy experts who actually know their subject but who have been dropped from the ministries or, if they work in independent research institutes, are never consulted. On the other hand, we know that Századvég has allegedly supplied the government in the past four and a half years with thousands and thousands of pages of advice on domestic and foreign policy strategy with which, it seems, the Orbán government is completely satisfied. What kind of advice is supplied to the Hungarian government is well demonstrated by an article by Gábor G. Fodor, the strategic director of Századvég, which was published on December 1 in Napi Gazdaság, the paper owned by Századvég. Very briefly summarized, the United States’ interest in Hungary and the East-Central European region is dictated by one consideration only: getting rid of the Russian monopoly over the gas supply in the region. All the attacks on Hungary in the last few months have served this purpose. The U.S. has a master plan: (1) Ukraine must fall into the sphere of American influence; (2) the United States wants to stop the building of the Southern Stream; and (3) the Americans intend to prevent the Russian purchase of the MOL shares in the Croatian oil company INA. The goal is “a total change of monopoly of gas supply in the region.” Hungary is at the center of this master plan and surely this is why Hungary suddenly became such an important country for the United States. Hence the attacks against the Orbán government. Can you imagine what kind of Hungarian foreign policy can be based on G. Fodor’s “analysis”? I shudder to think. I am not at all sure that Hungarian diplomacy in its present state can successfully navigate through the perilous sea Hungary managed to get itself into thanks to the brilliant strategy of Viktor Orbán. Until recently the Orbán government was certain that a Republican administration would have closer and warmer relations with them, but after McCain’s outburst they must realize that even if the Republicans win the next election Hungary will remain a pariah in Washington, unless some miracle happens in Budapest. Like Viktor Orbán vanishes from Hungarian politics. And that at the moment does not look likely. The title of yesterday’s post was “The Hungarian government turns up the heat on the NGOs.” Well, today it took on both the United States and the European Union. After some initial hesitation when János Lázár profusely praised the United States and extolled the friendship between the two countries, it seems that the decision was reached within the closest circle around Viktor Orbán that Hungary will not be “intimidated” by anyone. Hungary will strike back. Within a day Lázár was instructed to change his tune and attack the evil United States. Although he hid his message to the United States on the website of his hometown, Hódmezővásárhely, by today all the nationwide papers and internet sites reported on Lázár’s new attitude toward the United States and the European Union. He accused the United States of treating Hungary like an unequal partner and alluded to the so-called “gendarme pertue,” a reference to the practice during the Horthy period according to which the gendarmes used the familiar form of address with the peasants while the rural inhabitants had to use the formal with the gendarmes. * Being loyal to the European Union does not mean being a yes-man. Budapest is a faithful ally of Washington–and not because it dares not demand proof of serious allegations. Even the staff of Mandiner, a gathering place of the younger conservative generation, thought that drawing a parallel between Moscow and Brussels was “stupid.” And the author of the article listed some of the fallacies in Kövér’s contention. It was our sovereign decision to join the Union; we are members of the EU and not subjects as in the Soviet bloc; we can veto certain decisions unlike in the old days; there are no occupying forces in the country; we receive more money from the EU than we pay in; and finally, one of the official languages of the EU is Hungarian, while during the Kádár regime Russian was compulsory. Well, it was here that I could hardly retain my composure. These people try to justify their undemocratic, illegitimate regime by appealing to the blood and sacrifice of the revolutionaries of 1956. And that is not all. He had the temerity to claim that those who question the existence of democracy and the rule of law in Hungary insult the memory of the heroes of the revolution. Meanwhile, on another front, The Hungary Initiatives Foundation, which operates in the United States as a propaganda arm of the Orbán government, has lost almost half of its board members. Those who left are George E. Pataki, former governor of New York; Dr. Katrina Lantos Swett, daughter of U.S. representative Tom Lantos and vice chair of the United States Commission on International and Religious Freedom; Susan Hutchison, executive director of the Charles Simonyi Fund for Arts and Sciences; and Michael J. Horowitz, former director of the Hudson Institute’s Project for Civil Justice Reform and its Project for International Religious Liberty as well as a founding member of 21st Century Initiatives. Those remaining are former American ambassdor April H. Foley; Tamás Fellegi, a former member of the Orbán government; Dr. John P. Lipsky, former first deputy managing director of the IMF; Ambassador Kurt Volker, executive director of the McCain Institute for International Leadership; and Edith K. Lauer, chair emerita of the Hungarian American Coalition. Even among the remaining five we see some dissent. Kurt Volker, who used to be a steadfast supporter of Viktor Orbán, had some very harsh words about the latest Hungarian development in an interview with Péter Morvay in Washington. 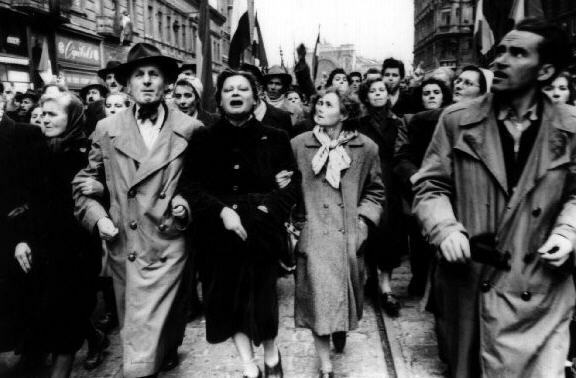 Ágnes Vadai of the Demokratikus Koalíció reacted to the László Kövér interview by saying that anyone who wants to lead Hungary out of the European Union is “an enemy of the country.” As are those who blaspheme the memory of 1956. *Apparently, gendarme pertu also means a slap in the face by the officer instead of greetings. The reaction to Viktor Orbán’s speech a week ago has been uniformly negative. Even the conservative Wall Street Journal agreed with the liberal New York Times that Orbán’s vision of the future of Hungary is incompatible with western values, specifically the values of the European Union of which Hungary is a member. A free and plural media is the foundation of a free society, and a safeguard of democratic tradition. The new “advertising tax” in Hungary shows it is still very much under threat. This new tax was introduced in Parliament in just a few days, without significant debate or consultation. Ostensibly an “advertising tax” to raise revenue, in fact it disproportionately affects on single media company, RTL. Indeed, according to their own calculations, they are the only single company that would face the highest rate of the tax; imposing significant losses and putting in jeopardy their ability to operate. The conclusion is obvious. RTL is one of the few channels in Hungary not simply promoting a pro-Fidesz line; it is hard to see that the goal is anything other than to drive them out of Hungary. The Hungarian Government does not want a neutral, foreign-owned broadcaster in Hungary; it is using an unfair tax to wipe out democratic safeguards, and see off a perceived challenge to its power. The freedom of establishment is a fundamental principle of the single market. But it is about more than just one tax or just one company: it is part of a pattern that is deeply worrying; a pattern contrary to the EU’s values. Taxation cannot be an instrument for discrimination, and tax policy should not be a political weapon. A new media law introduced in 2010 put huge powers over the Hungarian media into a body subject to political interference: breaching the Hungarian constitution and EU law and jeopardizing fundamental rights. Later on, opposition radio station Klubrádió lost its licence; they eventually got it back, after a complex and costly fight, but the episode revealed (in the words of the European Parliament) “biased and opaque tendering practices.” In 2013, new laws placed restrictions on political advertising. Meanwhile, just last month, the editor of oneline newspaper ORIGO was dismissed after it uncovered a political scandal; many ink his dismissal to political pressure. Some of these criticisms and concerns have been addressed, under pressure from the EU and the international community. Others remain a very real worry. A recent report from the OSCE shows that the impact this is having. It found that, in the run-up to recent elections, the majority of monitored TV channels showed “significant bias” towards ruling party Fidesz; with RTL being one exception. And it highlights an “increasing number of outlets directly owned by business people associated with Fidesz.” The picture it paints is of a media sector that is (at best) uncertain and self-censoring; and at worst partisan if not government-controlled. In that environment it is deeply damaging that the government would turn a blind eye: they should be engaging positively to manage threats to media pluralism. The fact is, government control, monopoly and censorship belong to a different, darker, period in Hungary’s history: and no one should seek a return to it. Fair and unbiased coverage is a principal function of a free and plural media. Undermining that, and attempting to silence dynamic debate, is an attack on Hungarian democracy. For the sake of that democracy, and of the Hungarian people who have fought so hard to enjoy its benefits, we cannot stand by as idle spectators. Hungary is not the only EU country where such concerns and debates exist; these are also issues raised, with different emphases and in different contexts, in Bulgaria, Italy, the UK and others. Europe needs to get its own house in order to ensure a free and plural media. There are many proposals out there for how to achieve that–including those set out in the Report of the High Level Group chaired by Vaire Viķe -Freiberga. It’s time we started taking those ideas seriously, for the sake of our freedom and democratic values. An answer came immediately from Gergely Gulyás, who was recently elevated to a new parliamentary position. He became deputy-president of parliament responsible for the legislative work of the House. In brief, all pieces of legislation that come before parliament will have Gulyás’s approval. Quite a position for a thirty-three year old. The tone of the letter is typical of this political leadership: arrogant and sermonizing. According to Gulyás, everything is in order with the advertisement tax. It has been in the works for years. RTL Klub is not being discriminated against, because the tax depends on advertising revenues. RTL just happens to receive the largest share of ad revenues. Every segment of society must bear its fair share of the tax burden. RTL is no exception. Political revenge on the part of the government is out of the question because RTL Klub until now spent little time on politics. However, since the passage of the tax law the station “has been one-sidedly slandering the government and its politicians.” It seems that for Gulyás reporting on political scandals is nothing but slander. Gulyás also objected to Kroes’s contention that the Hungarian government wants to drive out foreign companies. In this connection she reminded the Hungarian political leadership of “the freedom of establishment [which] is a fundamental principle of the single market.” Foreign companies have a large share of the Hungarian media market and this will most likely be the case for a long time to come, he said. As for “democratic values,” Gulyás would like to know exactly what kinds of values Neelie Kroes has in mind. 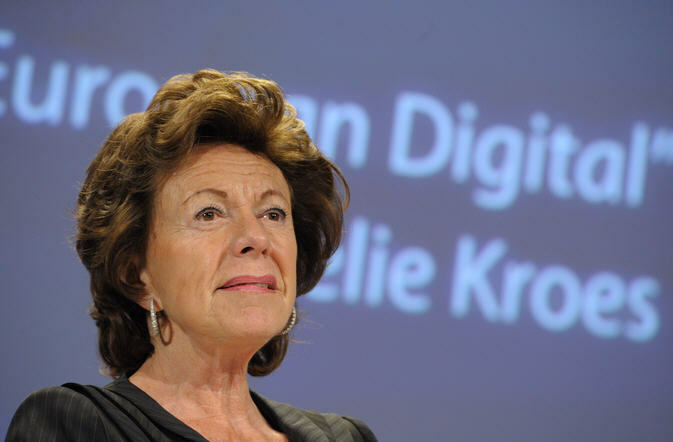 After all, in 2013 the secretary-general of the Council of Europe found everything in order with the 2010 media law that Kroes is now criticizing. Gergely must have been happy to find a factual error in Kroes’s letter in connection with Klubrádió. Indeed, Kroes wasn’t precise enough. Although Klubrádió valiantly fought for its survival for more than three years, it did not lose its license in Budapest. But what Gergely neglected to mention was that it did lose eleven other frequencies throughout the country. By now Klubrádió can be heard only in Budapest. Gulyás was equally at a loss to know what Kroes could possibly mean by “biased and opaque tendering practices” in allotting radio frequencies. Gulyás “would like to inform the Madame Commissioner” that all the rules and regulations are constitutional and transparent; all applicants are treated equally, and there is the possibility of legal appeal. As for the OSCE report which Kroes claims found bias in television news coverage in favor of the government, this allegation is also incorrect. If there had been such a bias, the liberal-socialist opposition parties would have gone to the Media Authority to protest, but with the exception of far-right Jobbik no party did. Finally, Gulyás complained about the political pressure coming from the European Union every time the Hungarian parliament passes laws affecting foreign banks and companies. This last accusation leads me back to Viktor Orbán’s speech. It looks as if the simultaneous appearance of two very strongly worded editorials in The New York Times and The Wall Street Journal surprised the right-wing political analysts. They can’t imagine that these two papers would independently call for strong sanctions against the Orbán government because they were genuinely shocked by the message delivered by Viktor Orbán on the virtues of “illiberal states.” Instead, they pulled out a favorite from the Hungarian right playbook, a conspiracy theory. Ágoston Sámuel Mráz of Nézőpont Institute, a right-wing think tank with large orders from the government, believes that “foreign interest groups may be behind the attack [on Viktor Orbán] which will be deprived of considerable revenues because of the reduction of utility prices, taxes on the banks and advertisement.” Csaba Lentner, an economist who currently teaches at the newly established Nemzeti Közszolgálati Egyetem (National University of Civil Service) thinks that The New York Times editorial might in fact be against international law because a newspaper from the United States is urging action by the EU against Hungary. A bizarre contention. I might add that Lenter, who is currently a great supporter of Fidesz, was a MIÉP member of parliament between 1998 and 2002. MIÉP was an openly anti-Semitic, far-right party.